The Sebastopol Documentary Film Festival runs March 29-April 1. Advance tickets, $10 for most films, may be purchased at the Sebastopol Center for the Arts or www.sebastopolfilmfestival.org. HOOP DREAMS 'Bound' follows Analy High grad Robert Johnson as he tries to make it in the NBA. 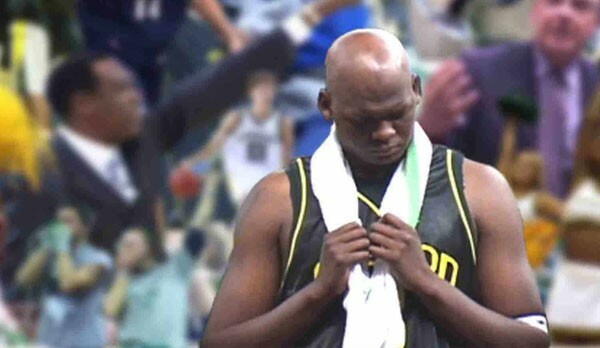 In 1996, a young man named Robert Johnson moved from a shooting-ravaged neighborhood in San Francisco's Fillmore district to Sebastopol, where he became a star basketball player at Analy High School. He went on to play a lead role for the University of Oregon team that reached the Elite 8 in the NCAA tournament in 2002. He dreamt of making it to the NBA. Sebastopol filmmaker Brenden Hamilton chronicles Johnson's journey in his fascinating full-length film Bound, featured in the fifth annual Sebastopol Documentary Film Festival, running March 29 to April 1. In its most ambitious program to date, the festival is screening 53 films over the course of four days, including an opening-night showing on March 29 of the aptly titled The First Movie in the 600-seat theater at Analy High School. "We've never had a venue larger than 100," says program director Jason Perdue. "We wouldn't have done it if we didn't have the perfect film." Several of the films being shown this weekend are by local filmmakers, a hallmark of the festival. Leap of Faith (April 1, 3:30pm) by Lina Hoshino, who owns Petaluma Pie Company, is a paean to those who saved Sebastopol's Enmanji Buddhist Temple. In the 1940s, shortly after the Japanese bombed Pearl Harbor, vandals tried to burn down the temple but were thwarted by determined locals. Built as an exhibit for the 1933 World's Fair in Chicago, the temple was dismantled, transported to Sonoma and rebuilt. During World War II, when many of its Japanese-American members were forcibly removed from their homes and taken to internment camps, their white friends volunteered for nightly watch-keeping vigils to repel arsonists. Burn marks remain on the temple to this day, a reminder of past trials. "This is the story of young people taking a leap of faith to help members of their community," Hoshino says in the film. "It reminds us that it is possible to stand by those who are endangered and victimized by the prevailing political climate." Mr. Cao Goes to Washington (April 1, 1pm) looks at the political climate of post-Katrina New Orleans. San Francisco filmmaker Leo Chiang follows the campaign of Joseph Cao, a Vietnamese Republican, against an incumbent African-American Democrat. The demographic odds are stacked against Cao, but this pro-life, ex–Jesuit seminarian manages to get elected. "The film is ultimately about the loss of innocence of an idealistic politician who tries to take on the partisan politics of D.C. and racial politics in New Orleans," says Chiang. A handful of the festival's films are beguiling shorts. Penultimate (April 1, 1pm) is a tribute to Forestville's "Pen Guy," Costas Schuler, who aimed to collect a million pens and plastered thousands of the most unusual ones to his art car. Living Tiny (March 31, 4:30pm) is a short film about the 100-square-foot home of Jay Shafer, founder of Tumbleweed Tiny House Company in Graton, who proves one can live well with few possessions and little space. And Hamilton's Bound (March 31, 11:30am), shows what happens to Robert Johnson who, like most college athletes, doesn't get drafted by an NBA team. We see Johnson adrift after his final season at the University of Oregon, and watch as he squanders a chance to impress the Portland Trail Blazers because he hadn't stayed in playing shape. But Johnson gets a shot with the Lakers, and Hamilton follows him to Los Angeles for a summer training camp, where he takes on pros such as Luke Walton and appears to get the better of them. "We said we were going to L.A. to make a movie, and we did it," said Hamilton, who made the film for $30,000 and managed to get interviews with basketball legends Danny Ainge and Jerry West. "We were in the right place at the right time so many times. The magic of the film is we really captured a moment in time that's still relevant today." Bound isn't just about basketball; it shows the difficult relationship between Johnson and his parents, as well as his struggles when he returns to San Francisco after completing his collegiate career. "The important part of the film is the family dynamic; that's what sets this film apart," Hamilton says. "It's not just a sports documentary. It's about life." Ultimately, says Hamilton, Bound is about the legions of players who just miss making it to the NBA. The takeaway, he says, is that today there are many places to play pro basketball, such as Europe, and that "if you follow your dreams, you're going in the right direction." In addition to the films mentioned above, here are festival director Jason Purdue's don't-miss picks. In 'The First Movie,' director Mark Cousins shows films to kids in a Kurdish village in Iraq. For some, it's the first time they've ever seen video—and then Cousins hands them cameras and shows them how to make their own movies. March 29, 7pm, Analy High School Auditorium; $20, film and reception. 'Where Soldiers Come From' presents a personal view of a group of close friends deciding to sign up for military service. The film chronicles the changes they go through overseas and the struggles they face as 23-year-old vets returning home. March 30, 7pm, Sebastopol Cinemas. 'Big in Bollywood' traces the rapid transformation of struggling Hollywood actor Omi Vaidya to Bollywood sensation. But life isn't all kheer and lassi for this Indian-American actor, who's torn between capitalizing on his success and returning to his wife in Los Angeles. March 30, 7pm, Sebastopol Veterans Building. 'Girl Model' is a poignant look into the lives of teens shipped from Siberia to Japan and the United States. We follow Nadya, a 13-year-old model, as she leaves home to try to ease her family's financial hardship, and we see the cost Nadya ends up paying. March 31, 7pm, Sebastopol Center for the Arts. 'Granito: How to Nail a Dictator' is a passionate quest to bring justice to a genocidal general. The film is part of the festival's Latino program. April 1, 1pm, Main Stage West. 'Everyday Sunshine: The Story of Fishbone' closes the festival. The film charts the rapid rise and rough crash of this edgy punk-funk African-American band, who will perform live after the film. April 1, 6pm, Hopmonk Tavern. Film, $10; concert, $20–$25.